If you’re wondering what to read, here are two simple ideas that we can combine to help us choose what to read next. Are you making the most of your reading time? While I read a lot of books that doesn’t mean I don’t spend a lot of time thinking about how I read. I constantly ask myself if I’m making the most use of my limited reading time. It turns out that most of the time the best way to improve your Reading Return on Invested Time (RROIT) is to carefully filter the books you read. Here is the simple two-step process I use to filter books. Get back to basics. Understanding the basics, as boring as it sounds, is one of the key elements of effective thinking. A lot of people assume the basics are not important and never really take the time to learn them, preferring the sexiness of complexity. Understanding a simple idea deeply, however, creates more lasting knowledge and builds a solid foundation for complex ideas later. Build your foundation. The key here is brutal honesty with yourself about what you really know. Take the time to do a Feynman One Pager on an idea you think you know really well. While easy, this process will reveal any gaps you have in your knowledge. The multidisciplinary mind understands the basic ideas. Acquiring the basic mental models from multiple disciplines allows you to see things that other people can’t. You don’t need to understand the latest study in biology, but you sure as heck better understand the concept of evolution because it applies to so much more than animals. Understanding the basics allows us to predict what matters. Put simply, people who understand the basics are better at understanding second and subsequent order consequences. Plus, how are we to have a chance of understanding complex ideas without a firm understanding of the basics. Remember, the slightest wind blows over a house without a foundation. For the perishable, every additional day in its life translates into a shorter additional life expectancy. For the nonperishable, every additional day may imply a longer life expectancy. So the longer a technology lives, the longer it can be expected to live. The nonperishable is anything that does not have organic or avoidable expiration dates. Time can predict value. While produce and humans have a mathematical life expectancy that decreases with each day, some things, like books, increase in life expectancy with each passing day. The perishable is typically an object, the nonperishable has an informational nature to it. A single car is perishable, but the automobile as a technology has survived about a century (and we will speculate should survive another one). Humans die, but their genes—a code—do not necessarily. The physical book is perishable—say, a specific copy of the Old Testament—but its contents are not, as they can be expressed into another physical book. When I see a toddler walking down the street holding the hands of their grandparents, I can reasonably assert that the toddler will survive the elder. When something is nonperishable that is not the case. 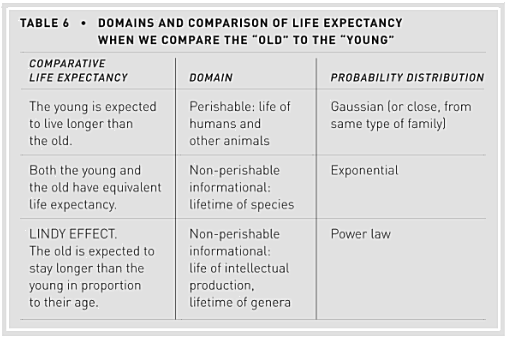 We have two possibilities: either both are expected to have the same additional life expectancy (the case in which the probability distribution is called exponential), or the old is expected to have a longer expectancy than the young, in proportion to their relative age. In that situation, if the old is eighty and the young is ten, the elder is elected to live eight times as long as the younger one. The longer something non-perishable has lived, the longer we can expect it to live. If a book has been in print for forty years, I can expect it to be in print for another forty years. But, and that is the main difference, if it survives another decade, then it will be expected to be in print another fifty years. This is where Taylor Pearson helped me put something together that I was just too stupid to do myself. He connects reading to the Lindy effect. Older isn’t better, it’s exponentially better. If you were to look at a typical person’s reading list, the vast majority of books would be crammed into the recent, low-value portion of the curve while many fewer books would occupy the much larger high-value, older section of the curve. So your ROI on reading and understanding a concept from 500 years ago is highly likely to be exponentially greater in the long run than one presented only 5 years ago. What I’m trying to get at is that the more fundamental or closer to the source that you move, the better the ROI in the long run. So let’s combine these ideas and focus on reading basic ideas that have stood the test of time as a means to understanding them better. Knowledge has a half-life. The most useful knowledge is a broad-based multidisciplinary education of the basics. These ideas are ones that have lasted, and thus will last, for a long time. And by last, I mean mathematical expectation; I know what will happen in general but not each individual case.